From the beginning, we have carried a cctv camera, used solely for the purpose of assisting us when unblocking domestic drains. We then ventured into Civil CCTV drain surveys, with Robotic CCTV inspection Cameras, allowing us to report on defects in new and existing civil pipelines including Build Over Infrastructure inspections, thus compiling surveys to meet council requirements. As the years, have passed, we have not only invested our time and money in new equipment… but a large portion of our business has become focused on CCTV drain inspections. We have undoubtedly become the ‘Go To’ Company for all CCTV inspection services for variety of purposes. No longer, do we ONLY offer inspections for sewer drains and storm water pipes. If there is something that needs a CCTV inspection and our cameras will fit…The sky is the limit. 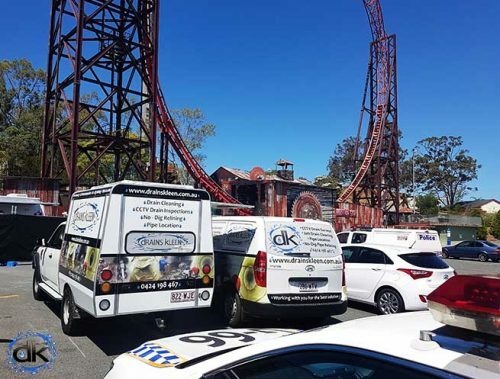 To name a few inspections carried out in recent times, Gas Lines, Pool pipes, fire hydrant lines, Pump lines, Septic trenches and last year after the horrific accident at Dreamworld, dRAINS kLEEN were called in to carry out a CCTV inspection for Workplace Health and Safety Queensland. Why are we the ‘Go To’ company for CCTV inspection? We not only have the right equipment, we have the knowledge and the required training to do the job properly. Licenced professional plumbers, will not only inspect your sewer but carry out repairs as well. WSA accredited cctv operators who know and understand the reporting code. On request, we also provide Laser profiling in conjunction with our CCTV inspection drain surveys. Currently working for Queensland Rail, Local Council, Various Engineers, Builders, Plumbers, Electritians, Earthmoving, Civil Construction Companies we have a reputaion built on trust. ← Serious about fixing your drainage problem?